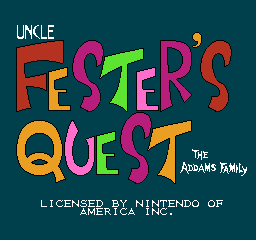 Fester's Quest is one of the first games based on The Addams Family, following Fester on his aforementioned "quest" to save Gomez from aliens. Jealous much, Fester? An icon for an unused special item...looks like a knight's hat and a shield. Armor, maybe? What seem to be two unused bosses. The one on the left has an empty space for what could be a (sprite-layer) shield, possibly the same as what the third boss has. The one on the right loads with the graphics for the final boss, the alien ship computer, so there may have been two bosses to be fought at this point. Could the bosses still be functional...? Also, graphics for a scorpion enemy, mentioned but mis-pictured in the manual. Although this theme is used for the beginning cutscene, only 12 seconds (out of 26) are used before the song fades out. The European version of Fester's Quest contains some differences that make the game noticeably easier. All enemies and bosses take less hits for them to be killed. The projectiles fired from the gun can go through walls and obstacles. This page was last modified on 9 October 2017, at 23:48.